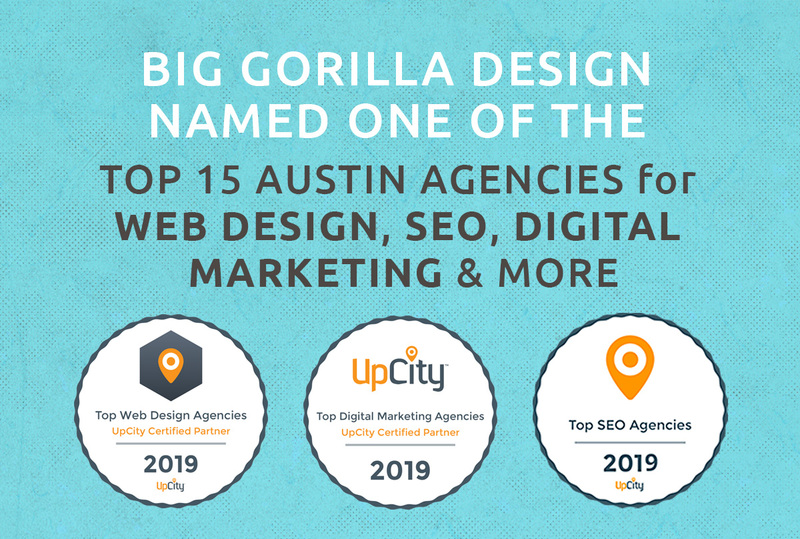 Big Gorilla Design Named One of Top 15 Austin Web Design Agencies , branding and marketing, we’re thrilled to be included among the best in the biz. Not only does it speak to our own success, but to the success of our clients as well. Thanks much UpCity for the wonderful recognition as one of the top web designers in Austin! "I was looking for graphic designers near me, when I came across Big Gorilla Design. They did a phenomenal job on the graphic designs I had them do, and they were reasonably priced." "Big Gorilla consistently provides me with great work in a timely manner. "Searching for web designers near me, I found Big Gorilla Design. Not only did they provide me with a fantastic web site design that converts really well, but they’ve also done an excellent job with my PPC & SEO campaigns." "Simply put, I would never work with anyone but Big Gorilla." Thanks UpCity for Naming Us One of the Best Austin Web Designers, Digital Marketing Agencies & SEO Companies from 2016 TO 2019! The road to success is paved with bananas (and a few other cool things).